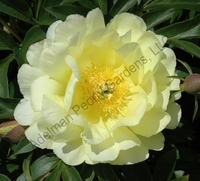 Yellow, full semi-double, fragrant, midseason, 30" tall, lutea hybrid tree peony. Bright lemon-yellow flowers with tightly packed petals that hang down on the short bush. Yellow, semi-double to double, lemon fragrance, midseason, 34" tall, Itoh. Lemon-yellow flowers with a soft touch of red. APS Gold Medal Award 2006. Award of Landscape Merit 2009. Yellow, single, midseason, 22" tall, intersectional/Itoh. This yellow intersectional is quite short and a good subject for positioning as a prostrate shrub flowing over rocks. Yellow, semi-double, very fragrant, mid to late season, 30" tall, intersectional. Beautiful yellow flowers with muted red flares. Long bloom period. APS Gold Medal Award 1996. ALM 2009. Yellow, single, lightly fragrant, midseason, intersectional/Itoh. An excellent landscape plant. Striking in its simplicity of a yellow bloom that radiates red flares from the center. Yellow, anemone to bomb-type double, fragrant, late-midseason, 28" tall, hybrid. 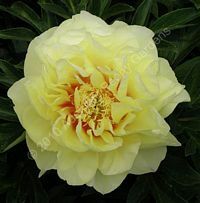 A gorgeous yellow that will be noticed in the garden. The mature flower form is a bomb-type double. Yellow, semi-double, midseason, 30" tall, Itoh. A delightful flower that changes color as it matures. 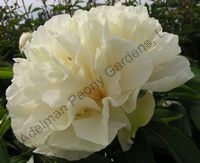 You will want to stay in the garden to watch it change from peach/salmon to yellow tones on the same petal. 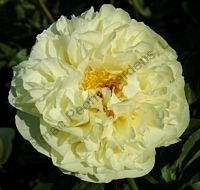 Yellow, semi-double, fragrant, early, 28 tall, hybrid. A lemon yellow full flower with golden stamens peeking through beside the bright pink carpel tips. Strong stems hold the flower upright. Yellow, semi-double, midseason, 34 tall, Intersectional. 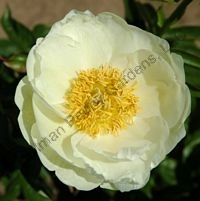 A delightful light yellow bloom that can have a lavender streak, or can even be half lavender. Lovely deeply cut, glossy, dark green foliage. Yellow, single, early, 24" tall, species. Lemon-yellow simple flowers set off ovate gray-green foliage with reddish stems. Likes a lightly shaded site. 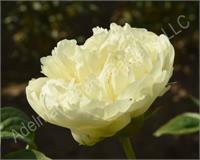 Pale yellow, single to semi-double, midseason, 32" tall, hybrid. 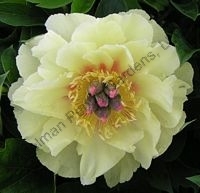 A soft yellow that gives emphasis to any garden or flower arrangement. Place behind complimentary plants as the foliage is not outstanding. Apricot, semi-double, midseason, lightly fragrant, Itoh. Bloom appears light orange upon opening, fading to yellow. 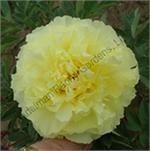 Yellow, semi-double, midseason, fragrant, 48" tall, Itoh. Yellow in its entirety with many blooms. Apricot-fading yellow, single, lightly fragrant, midseason, 34" tall, intersectional/Itoh. The flowers open apricot and fade to yellow with red flares and red carpal tips. Yellow, double, midseason, intersectional. A huge full yellow flower sometimes having a touch of red in the center. A 1st year plant had 5 large buds, one was taken to the APS show where it received Court of Honor. Yellow, single, midseason, 35" tall, intersectional/Itoh. Opening a rosy yellow and turning to clear yellow with small red center flares. Ovary sheath and the carpal tips are yellow. 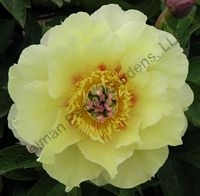 Light yellow, single, midseason, 33" tall, intersectional/Itoh. 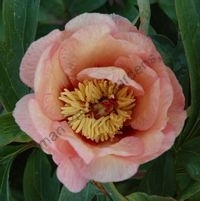 The bloom opens apricot color and fades to a lively yellow. The plant has generous blooms and attractive leaves. Yellow, double, lightly fragrant, early, 32" tall, hybrid. 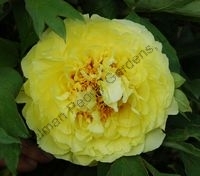 A large, butter-yellow, full double peony. The flowers are so large that the stems need support. Our guests rave about it. Yellow, semi-double to double, fragrant, early, 36" tall, hybrid. Sturdy plant with dark green foliage. 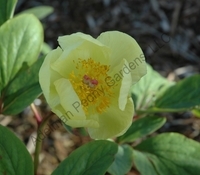 Light yellow rounded petals have an irregular toothed edge. 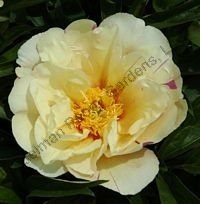 Yellow, single, lightly fragrant, 34" tall, intersectional/Itoh. 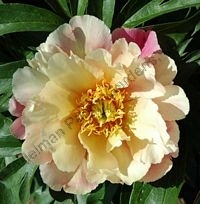 Soft yellow petals with light red center flares. Robust, excellent landscape plant.